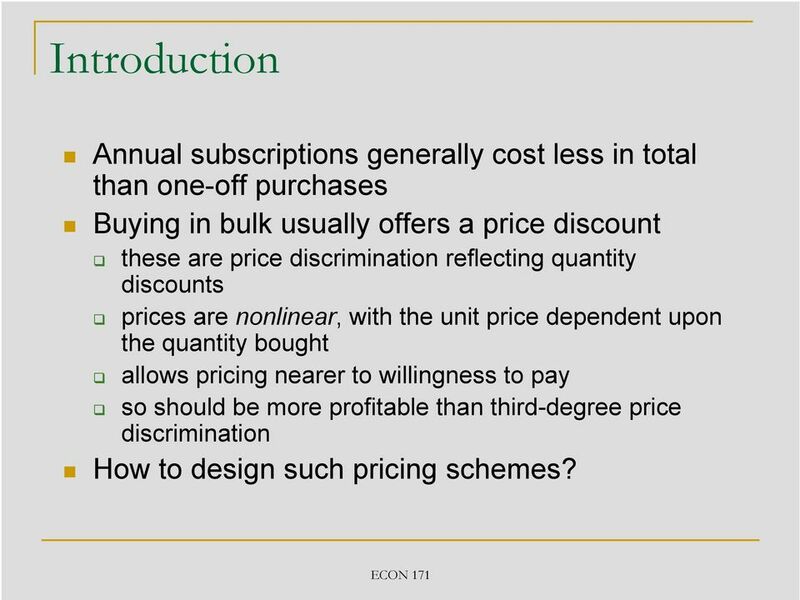 Download "First degree price discrimination ECON 171"
2 Introduction Annual subscriptions generally cost less in total than one-off purchases Buying in bulk usually offers a price discount these are price discrimination reflecting quantity discounts prices are nonlinear, with the unit price dependent upon the quantity bought allows pricing nearer to willingness to pay so should be more profitable than third-degree price discrimination How to design such pricing schemes? 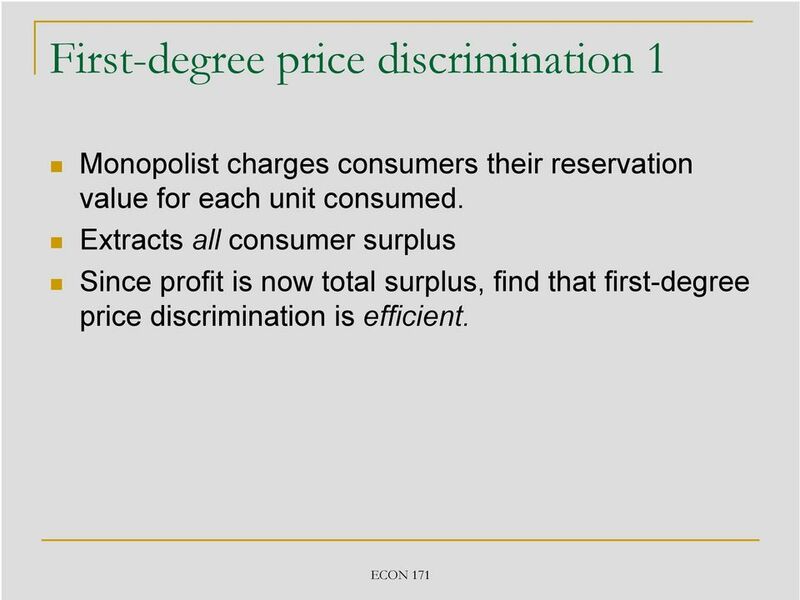 4 First-degree price discrimination 1 Monopolist charges consumers their reservation value for each unit consumed. 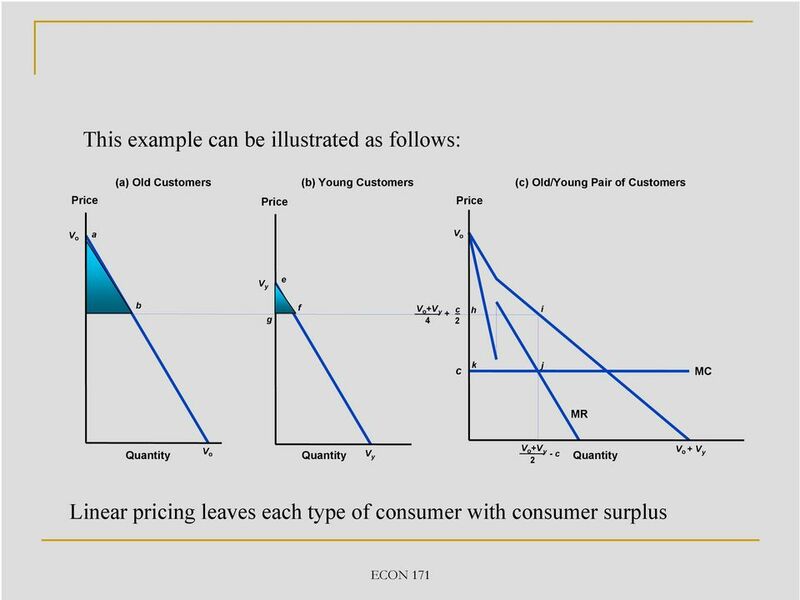 Extracts all consumer surplus Since profit is now total surplus, find that first-degree price discrimination is efficient. 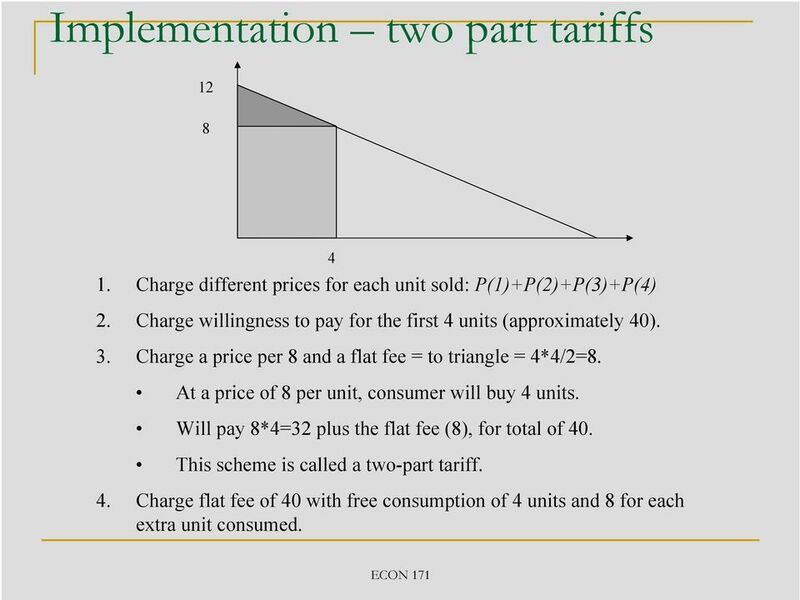 7 Implementation two part tariffs Charge different prices for each unit sold: P(1)+P(2)+P(3)+P(4) 2. 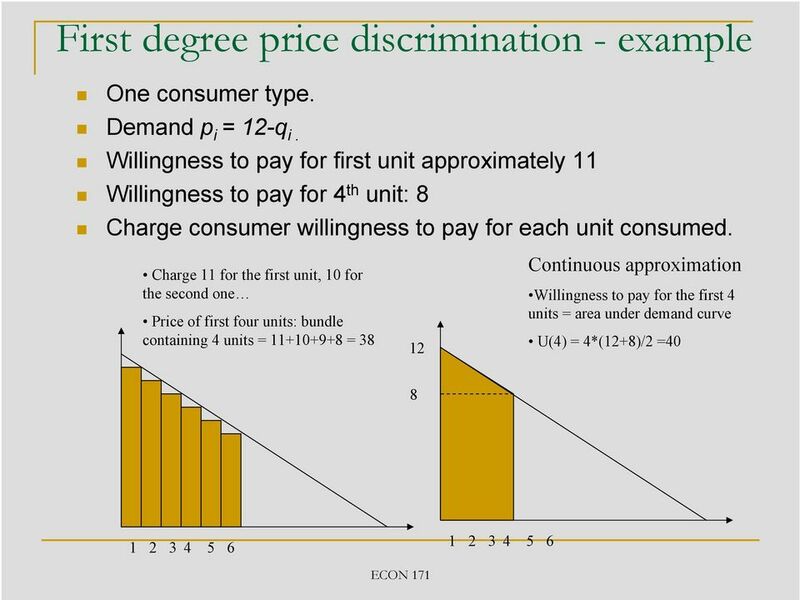 Charge willingness to pay for the first 4 units (approximately 40). 3. 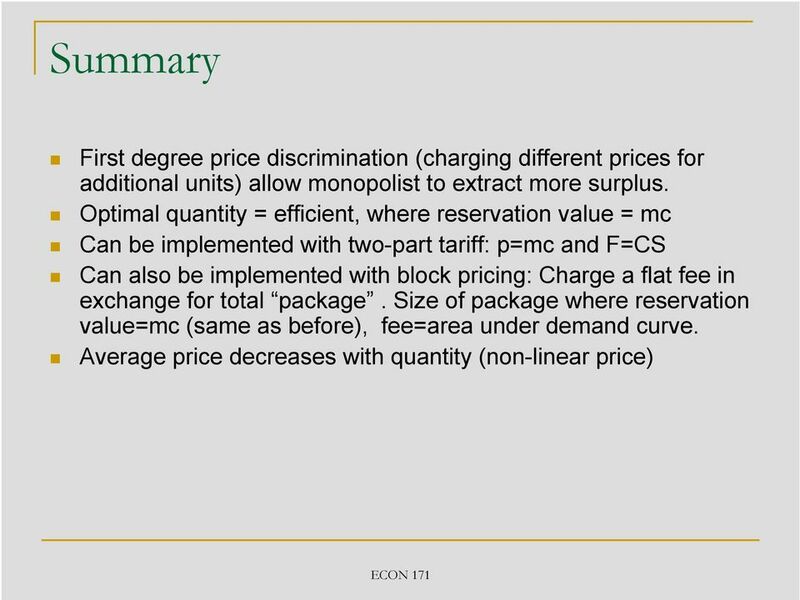 Charge a price per 8 and a flat fee = to triangle = 4*4/2=8. 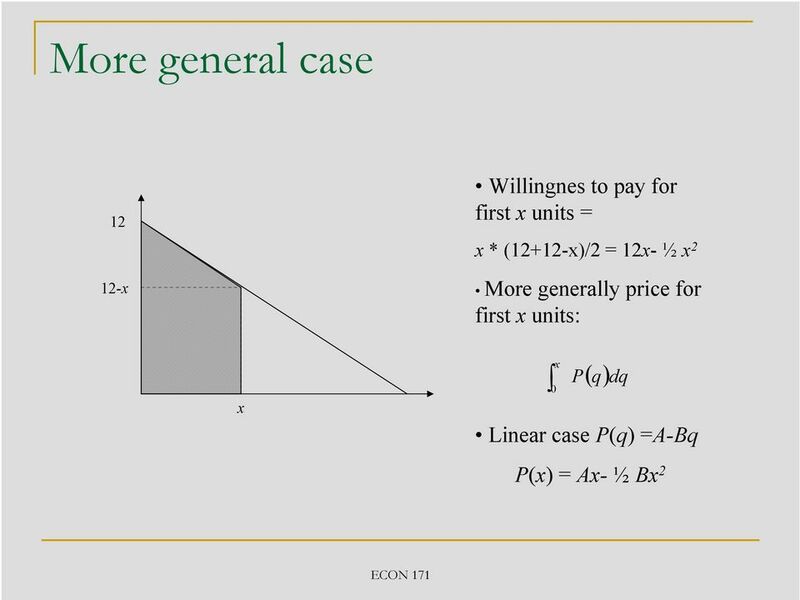 At a price of 8 per unit, consumer will buy 4 units. 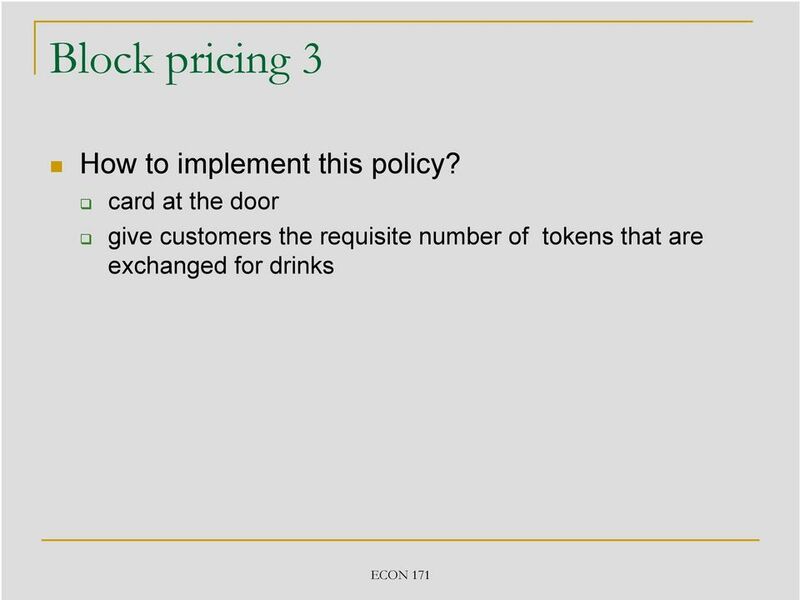 Will pay 8*4=32 plus the flat fee (8), for total of 40. 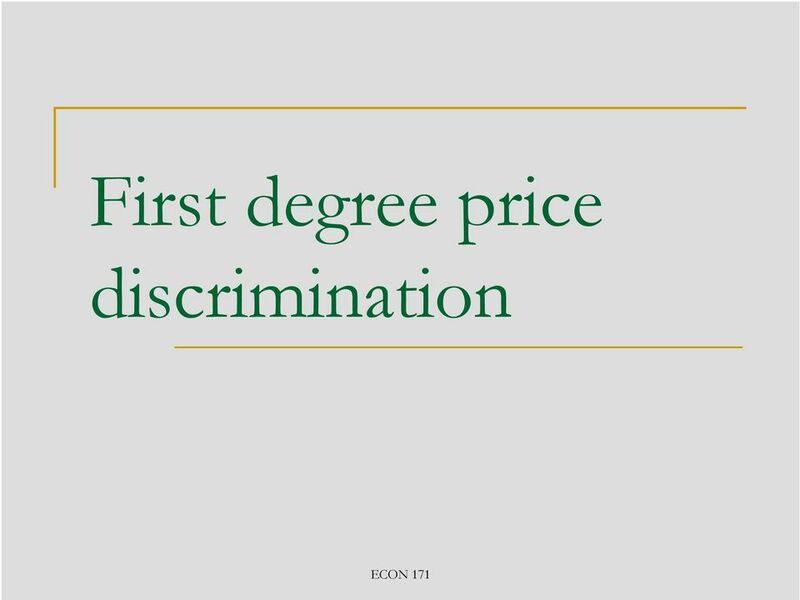 This scheme is called a two-part tariff Charge flat fee of 40 with free consumption of 4 units and 8 for each extra unit consumed. Theory of Regulation PhD, DFA M. Victor M. Martins Semester 2 2008/2009 2. 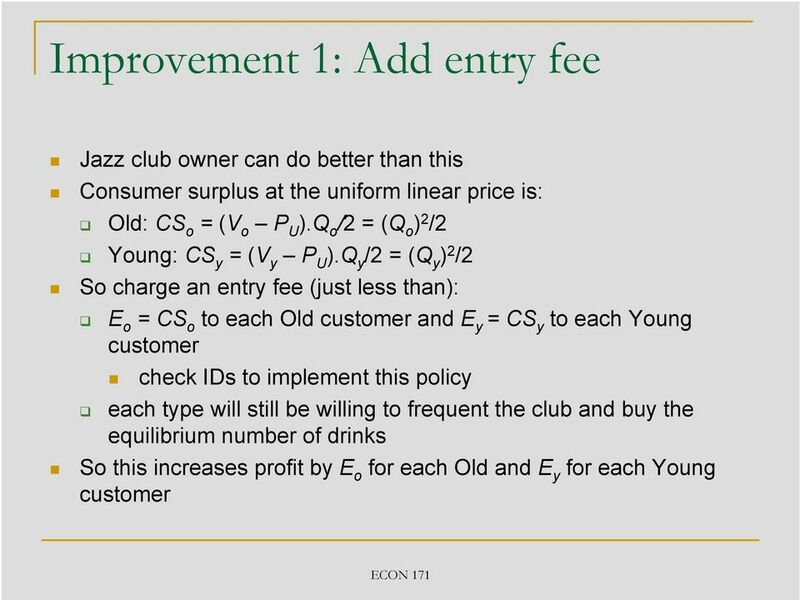 1 Natural monopoly regulation 2. 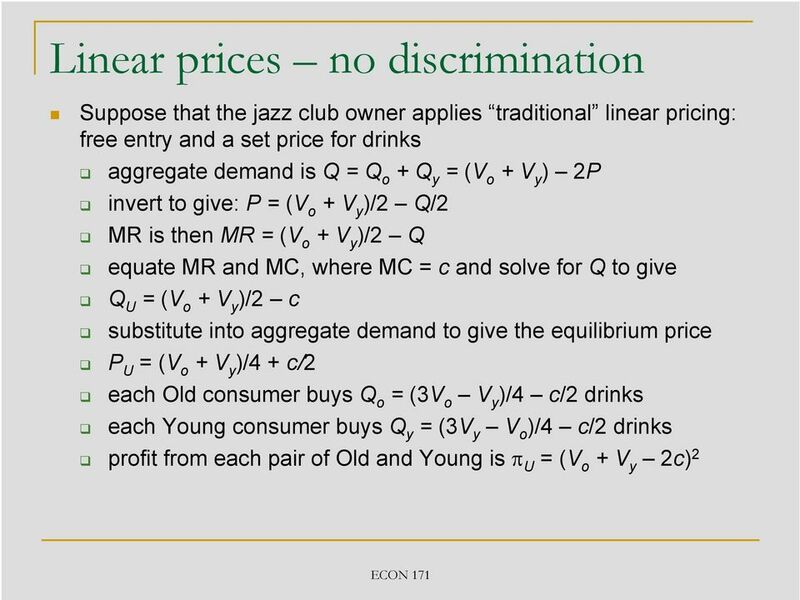 1 Natural monopoly regulation: efficient pricing, linear, non linear pricing and Ramsey pricing. 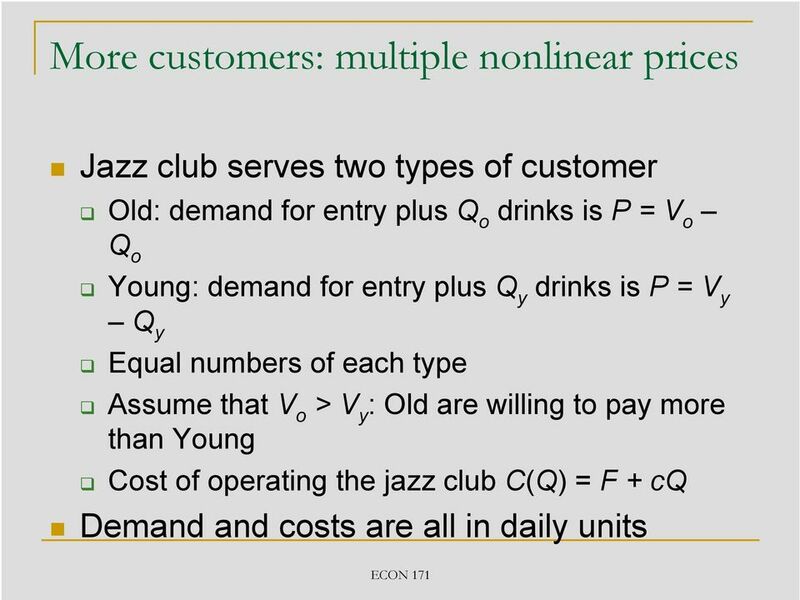 nonrivalry => individual demand curves are summed vertically to get the aggregate demand curve for the public good. 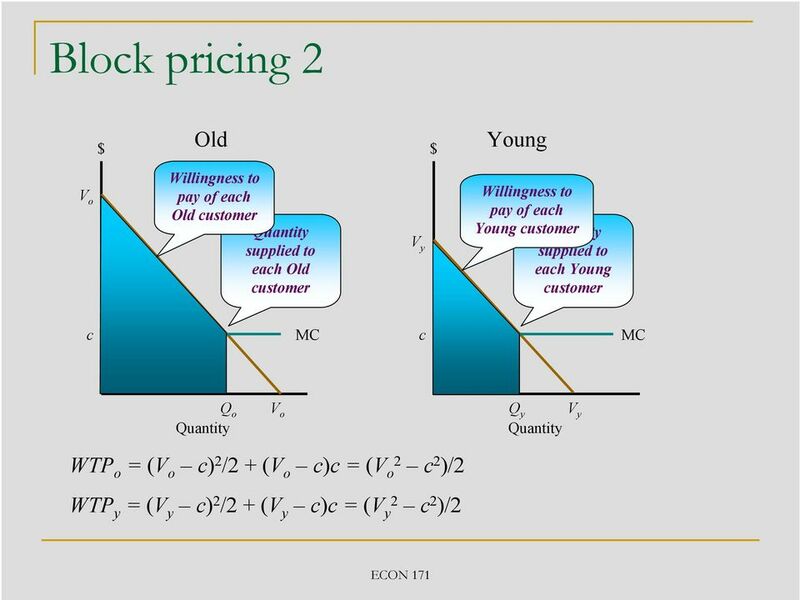 The Efficiency of Markets. 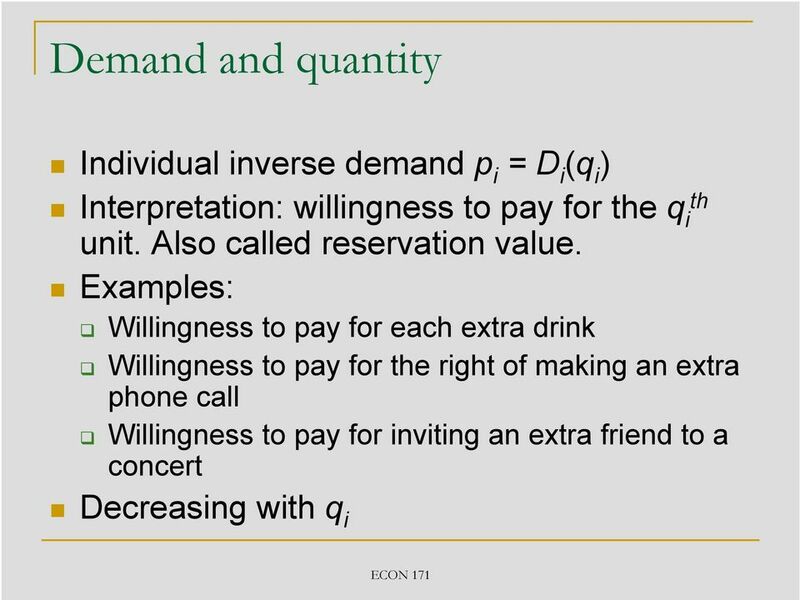 What is the best quantity to be produced from society s standpoint, in the sense of maximizing the net benefit to society? 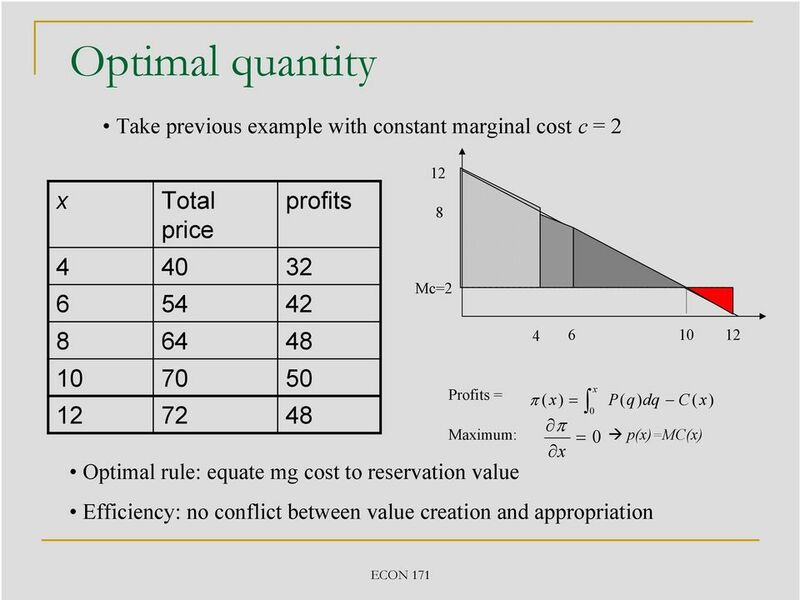 The Efficiency of Markets What is the best quantity to be produced from society s standpoint, in the sense of maximizing the net benefit to society? 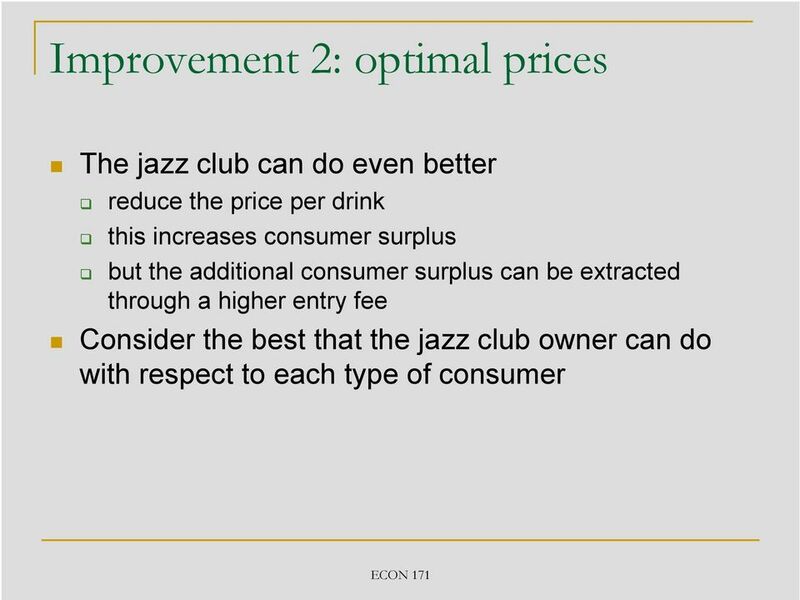 We need to look at the benefits to consumers and producers. 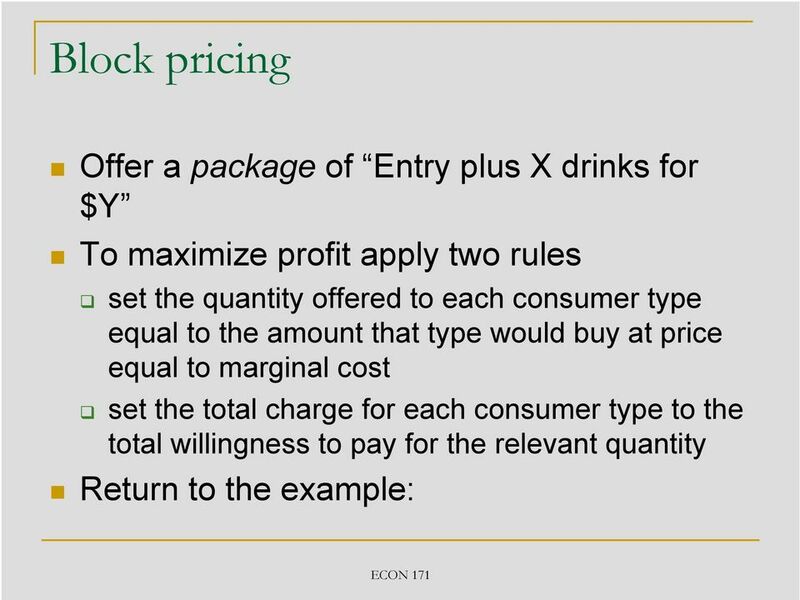 Logistics Management Inventory Cycle Inventory. Özgür Kabak, Ph.D. 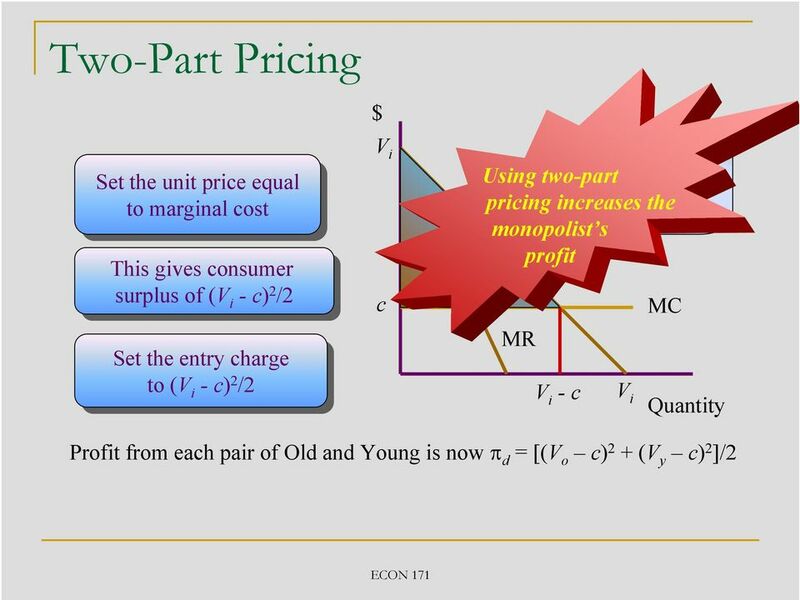 Managerial Economics & Business Strategy Chapter 9 Basic Oligopoly Models McGraw-Hill/Irwin Copyright 2010 by the McGraw-Hill Companies, Inc. All rights reserved. Overview I. 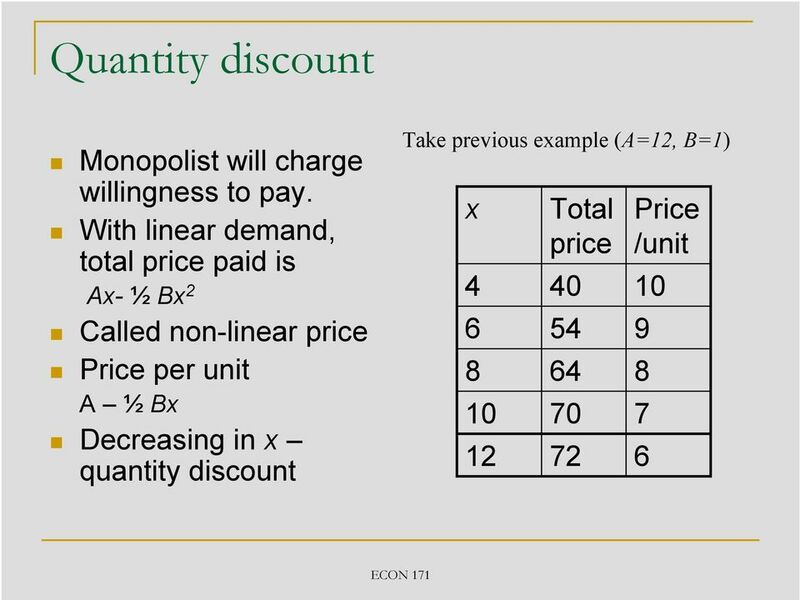 Conditions for Oligopoly?